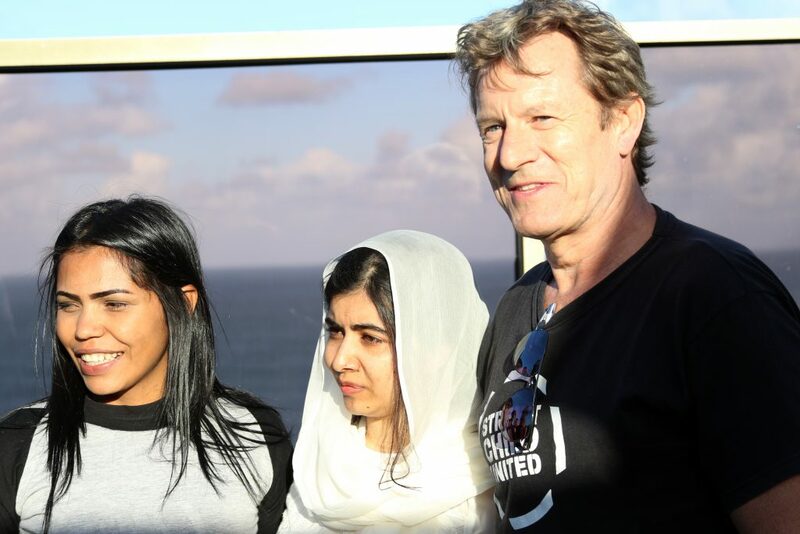 Street Child United Brazil (SCUB) were recently visited by Nobel Laureate Malala Yousafzai, who joined the players for a kick-about on Copacabana beach. RIO DE JANEIRO, BRAZIL – After raising around R$12,000 at the British and Commonwealth Society’s Christmas Festival, Street Child United Brazil are now ready to begin work on the refurbishment of their flagship football (soccer) pitch built in Complexo da Penha. Drika Santos (pictured left of Malala Yousafzai and Adam Reid) is one of SCUB’s coaches, and in 2017 she was elected as one of the BBC’s ‘100 Women of 2017,’ photo courtesy of Adam Reid/SCUB. This year, Reid comments, is all about going back to the power of sport. “The pitch is in a terrible state, so our main aim right now is to raise funds and rebuild the pitch.” He continues, stating that he is hoping to continue their positive relationship with the British School, who have helped raise funds in the past. Once the pitch is rebuilt, SCUB are going to be offering a fresh program with their two coaches, Drika Santos and Gabriel da Silva, who have received training from Coaches Across Continents and the United Nations to create and run the daily sessions. “This new program is going to be centered around using sport to help with life skills.” comments Reid. “So we’re talking health and well-being, promoting the rights of the children, including a right to protection from violence, a right to gender equality and education.” Gender equality in an often male-focused sport has been one of SCUB’s aims from its inception, with around sixty-five percent of their participants being female. Reid continues. “We will continue on this program with the older participants to also encompass access to employment, because they come from the side of town where opportunities are limited.” Reid stresses how they want to the young people from SCUB to be empowered and feel as if they are the masters of their own stories, no matter their background and living circumstances. “We’re very proud of what we’ve achieved, going back to 2015 when we set up. If you see what we’ve managed to do on a very, very limited budget. We’ve managed to do a lot.” Reid says. 2018 was an amazing year for SCUB, with highlights including the girls team winning the Street Child World Cup in Moscow, a visit from Nobel Peace Prize laureate Malala, and the unveiling of a special Street Child United Brazil statue at Rio’s Maracanã Museum. Starting as a legacy from the 2014 Street Child World Cup, Street Child United Brazil continued into 2016 where they again participated in the Street Child games in 2016 to tie in with the Olympics. Following the Street Child World Cup, the local organization was approached by GM Chevrolet to build a football field in an area where it would be of most value to young people. The pitch was built in 2015, in partnership with GM Chevrolet. 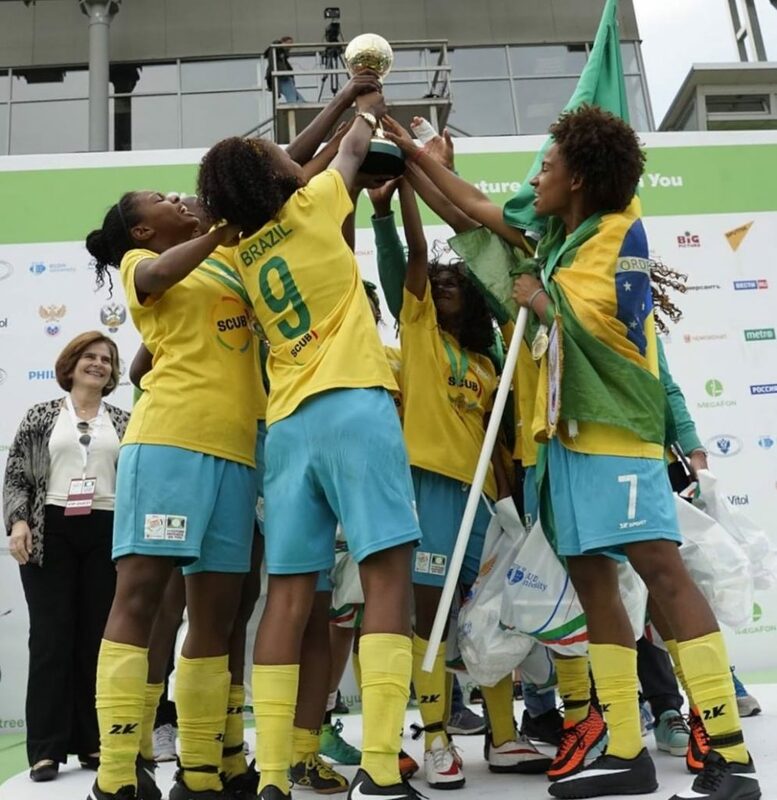 2018 was a triumphant year for the girls team, who lifted the Street Child World Cup trophy in Moscow, photo courtesy of Adam Reid/SCUB. Despite the pitch’s current condition, SCUB are still offering training every night. “It’s open to 300 and we usually get 45 per day.” Reid adds. There are two training sessions per day, usually divided by age. “We have boys and girls playing together, but girls have their own training sessions on Tuesdays and Thursdays.” He continues.